I want to tell you about why I love coaching soccer. But I’ll begin with why I find coaching so bloody hard. My U13 Girls team spent the weekend at a tournament, our first competitive tournament ever. I’m pretty sure we came in last, though I haven’t checked the stats to confirm that. We mostly lost games. I was pretty bummed out after yesterday’s games, both against teams I believed we could have beaten. Things looked messy on the field. The grass was long. Our passes died. We struggled. I felt like a coaching failure, to be frank. Maybe I’m not cut out to coach competitive soccer, I thought — I’m not willing to short-shift kids who are trying their best but may not be as skilled as other players, for example; I want to win as a team or lose as a team, not just play my 11 best and bench everyone else. Maybe, I thought, my priorities and instincts are all wrong for competitive play. 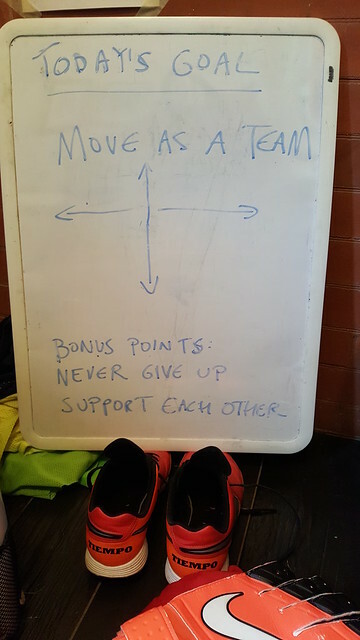 But luckily Kevin (who was coaching our youngest’s team at the same tournament) stopped by for half a game, and he offered a different perspective on what he’d seen. Sure, the players looked shaggy, sure, we were losing, but the kids on the bench were having a hoot. Everyone was talking and laughing. And on the field, no one gave up, everyone tried their best right to the final whistle. We were a bit disconnected, that’s all. I took his observation to heart. The players had supported each other well off the field, and their spirits had remained high. We had some good stuff to build on. Could we transfer that connection and communication onto the field? I boiled down my message and set today’s team goal: MOVE AS A TEAM. What a difference! The progress we made from one day to the next was astonishing. The support and enthusiasm I’d seen on the bench translated onto the field. (It helped that the grass was shorter too). But what makes me proudest is what I witnessed from my team during tough moments today. When a player was struggling between games, the whole team surrounded her to express how valuable she is to them (I did not cue them to do this — it was a spontaneous outpouring). (This player went on to have a strong game.) On the bench, I heard many kind and enthusiastic words spoken. A player who was upset about a call got a big calming hug from a teammate. We took some hard calls in our second game, but remained respectful to the end. What I witnessed throughout was a desire for mutual success that was completely contagious. Empathy in action. So, we didn’t win. Not a single game. But the players grew miles as a team, we scored some awesome goals, and we progressed and learned a lot in a compressed span of time. It’s exciting to imagine what these kids will be able to accomplish, together, during our summer season. And that’s why I love coaching. Carrie we have a wonderful team. I was so impressed with how the girls played. In my heart they won this tournament with life lessons learned…try your best, work as a team, never give up, be respectful. I am so proud of this team and coaching. Thank you. Thank you, Jada! I’m so glad you feel this way. I truly believe there are ways to win as a team that can’t be measured in final scores. I’m incredibly proud of each player on this team! And this why we love you ad your writing. When I was a kid our local sports announcer on CKCW tv would end his sportcast like this : “Remember folks, it’s not water you win or lose its hoooooow you play the game! Goooood Night! Then he’d flip his pen in the air and catch it. Every time. I never ever ever forgot his voice ….. hoooooooow you play the game. It is in the next novel -if I ever finish it.